dp-ucMGP levels were much higher in patients being treated with VKA and little overlap was found with those not being treated (5604 [3758; 7836] vs. 1939 [1419; 2841] pmol/L, p <0.0001). In multivariate analysis, treatment with VKA was the most important variable explaining variation in dp-ucMGP levels even when adjusting for all other significant variables. In the 137 untreated patients, dp-ucMGP levels were significantly (p < 0.05) associated both in the uni- and multivariate analysis with age, body mass index, plasma levels of albumin, C-reactive protein, and FGF-23, and the vascular calcification score. Matrix Gla protein (MGP) is an 11 kDa protein secreted by chondrocytes and vascular smooth muscle cells (VSMCs) . MGP acts as a potent local inhibitor of vascular calcifications by directly inhibiting calcium precipitation and crystallization [2, 3] and/or by antagonizing bone morphogenetic protein (BMP2), which itself promotes osteoblastic differentiation of VSMCs . MGP-deficient mice have been shown to develop excessive and premature arterial calcifications, leading to death by rupture of the aorta in the first two months of life . In order to be fully active, MGP must first undergo two posttranslational processes: the phosphorylation of three serine residues (although the role of this phosphorylation process is still not well understood) and the carboxylation of five glutamate residues [5, 6]. This explains why it is theoretically possible for several different isoforms of MGP to be measured in the plasma (a combination of carboxylated, uncarboxylated and phosphorylated, unphosphorylated MGP). Different fragments of MGP may, in fact, have different physiological roles and meanings [7, 8]. In this article, we will focus on the inactive form of MGP (dephosphorylated and uncarboxylated: dp-ucMGP). Because γ-glutamyl carboxylation is highly dependent on availability of vitamin K , it is possible that the measurement of dp-ucMGP would reflect vitamin K status [7, 10]. In hemodialysis (HD) patients, vascular calcifications are precocious, frequent and excessive [11–14]. The association between the level of vascular calcifications and mortality has been described in HD patients in various studies [15–17]. There are several in vitro and in vivo data suggesting a direct link between the decreased availability of vitamin K and vascular calcification, based on the role of this vitamin in the activation of MGP [9, 18]. Various authors have described a decreased availability of vitamin K (both K1 and K2) in patients with chronic kidney disease (CKD) [19–24]. As a result, the level of the inactive form, dp-ucMGP, has been found to increase in these patients, in comparison with non-CKD patients [7, 10, 21, 22, 25]. In addition, vitamin K therapy has been shown to significantly decrease the levels of dp-ucMGP both in the general population [8, 26] and HD patients [7, 10, 27]. Conversely, it has been shown in the general population and in CKD patients that vitamin K antagonist (VKA) is associated with higher dp-ucMGP levels [8, 23]. If the same higher concentration is also observed in dialysis patients is not known. These results suggest that dp-ucMGP could reflect a person’s vitamin K status at the vascular level [7, 10, 21, 27–29]. Moreover, it is interesting that, in CKD patients, some authors have found a significant correlation between dp-ucMGP levels and vascular calcifications  but this finding has not been confirmed by others . This point is thus still debatable. In this study, we measured dp-ucMGP levels in a cohort of HD patients and compared the results between those being treated or not with VKA. We also assessed the potential relationship between dp-ucMGP levels and the vascular calcification score. Prevalent hemodialysis patients from three independent centers in Liège and the surrounding areas in Belgium, were included in this observational cohort study (Centre Hospitalier Universitaire du Sart Tilman, Centre Hospitalier Regional de La Citadelle, Centre Hospitalier Bois de l’Abbaye de Seraing). From the initial sample (n = 212), we restricted the analysis to patients who were able and agreed to have their vascular calcification score measured (n = 165). Vascular calcifications were assessed by lateral X-ray radiography (the "Kauppila" method) and the score (between 0 to 24) was established by the same experienced investigator (LM) [30, 31]. Of the 165 patients, MGP was not measured in 5 patients, due to technical issues. In the final sample, 23 patients were being treated with VKA (acenocoumarol, Novartis Pharma) and 137 patients were not being treated with this therapy. The following clinical data were considered: age, gender, body mass index (BMI), dialysis vintage, previous cardiovascular disease, hypertension, diabetes and smoking habit. Hypertension was defined as having a blood pressure greater than 140/90 mm Hg and/or being in receipt of treatment for hypertension. Diabetes status was obtained from electronic medical files and/or defined according to being in receipt of treatment for diabetes. Previous cardiovascular disease was defined as having a history of myocardial infarction, percutaneous coronary artery intervention, cardiac surgery, peripheral artery disease or cerebrovascular disease. Data were extracted from electronic medical files and completed through interviews with the patients. Patients were defined as having a smoking habit if they currently smoked. All data from the electronic files have been then confirmed by nephrologists taking care of the patients. The following laboratory data were studied (one-point measurements): plasma levels of calcium, phosphorus, albumin, C-reactive protein (CRP) (measured using the Modular P autoanalyzer, Roche, Mannheim, Germany), intact parathormone (measured using the Elecsys analyzer, Roche, Mannheim, Germany), 25-OH vitamin D, bone-specific alkaline phosphatase (measured using the Liaison analyzer, Diasorin, Stillwater, MN) and C-terminal Fibroblast Growth Factor (FGF-23) (measured by ELISA, Biovendor, Czech Republic). dp-ucMGP was quantified by the first automated method available on the market (supplied by IDS, Boldon, UK). A precision profile was determined using 4 plasma samples (264-2703 pmol/L), measured twice a day for 10 days. CV intra-assays and inter-assays were thus measured at 2.9-8.9% and 4.1-13.4%, respectively. The IDS kit was found to be linear up to a value of 9724 pmol/L. We also measured dp-ucMGP levels using this kit in a healthy population (n = 62) and the expected (normal) range was found to be < 572 pmol/L. Concomitant therapies were available but not included in the final statistical analysis: 63% were treated by low dosage of calcium (carbonate or acetate), 25% by sevelamer, 5% by lanthanum, 66% by cholecalciferol and 29% by active vitamin D.
Human subjects procedures in the present study were in accordance with the ethical standards of the Helsinki Declaration of 1975. All participants provided their written informed consent. The study and the approved consent were approved by the Ethics Committee of the University Hospital, CHU Sart Tilman "Comité d’éthique Hospitalo-Facultaire Universitaire de Liège, http://www.chu.ulg.ac.be/jcms/c_11204/comite-d-ethique-hospitalo-facultaire". The Ethics committee of the University Hospital has the authority to approve the study for all participating sites. The Belgian number of this study is B707201215885. Immunodiagnostic Systems (IDS) PLC provided the kits for measuring dp-ucMGP levels but the company was not involved in the study design, data analysis, or preparation of the manuscript. Data were expressed as mean ± standard deviation (SD) when the distribution was normal and as being in the median and interquartile range [IQR] if not. As appropriate, the baseline characteristics were compared between treated and non-treated groups using the Student’s t-test, the Mann–Whitney U test or the Chi-square test. Regression analysis was used to study the potential linear relationship between the vascular calcification score and dp-ucMGP levels. A multivariate analysis was also performed with variables that were found to be associated with dp-ucMGP in the univariate analysis (p = 0.1). We defined tertiles according to dp-ucMGP concentrations and compared the vascular calcification score between the tertiles using the Mann–Whitney and Kruskal-Wallis tests. All statistical analyses were conducted using the Medcalc (Mariakerke, Belgium) and SAS 9.3 (SAS Institute Inc. Cary, NC) software. The clinical and biological variables of the total population of the study (n = 160) are summarized in Table 1. The concentration of dp-ucMGP was high in our HD patients: 2148 [1542; 3251] pmol/L. Table 1 also shows the differences in the clinical and biological variables between the 23 patients being treated with VKA and the 137 not being treated with VKA. No significant difference was observed regarding clinical characteristics, except in the percentage of patients with hypertension, which was slightly higher in patients being treated with VKA. We observed a significant difference in dp-ucMGP levels, with a much higher concentration in patients being treated with VKA and little overlap with patients not being treated with VKA (5604 [3758; 7836] vs. 1939 [1419; 2841] pmol/L, p <0.0001) (Figure 1). In the multivariate analysis (generalized linear model) on all patients, treatment with VKA was, by far, the most important variable explaining variation in dp-ucMGP levels (R2 = 0.59, p < 0.0001). Note: conversion factor for units: phosphorus in mg/dL to mmol/L, x0.3229. Data are expressed as mean ± standard deviation (SD) when distribution was normal and as median and interquartile range [percentile 25; percentile 75] when not. CVD, cardiovascular disease; CRP, C-reactive protein; PTH, parathormone; b-ALP bone-specific alkaline phosphatase; dp-ucMGP, dephosphorylated and uncarboxylated; NS, non significant (p > 0.05). In the 137 patients not being treated with VKA, dp-ucMGP levels were significantly (p < 0.05) associated in the univariate analysis with age and BMI, and with plasma levels of albumin, CRP and FGF-23. All these associations were positive, except with albumin. Also, a slight but significant correlation was found between dp-ucMGP levels and the calcification score (r = 0.17, p = 0.049) (Figure 2). In the multivariate model, dp-ucMGP levels were significantly associated with BMI (p = 0.0032), and with plasma levels of albumin (p = 0.0368), FGF-23 (p = 0.002) and CRP (p = 0.0012), as well as with the calcification score (p = 0.0206) (Table 2). Note: r is the zero order correlation coefficient for the variable in the univariate analysis. p is the p value of the variable in the multivariate analysis. CRP, C-reactive protein; FGF, Fibroblast Growth Factor. 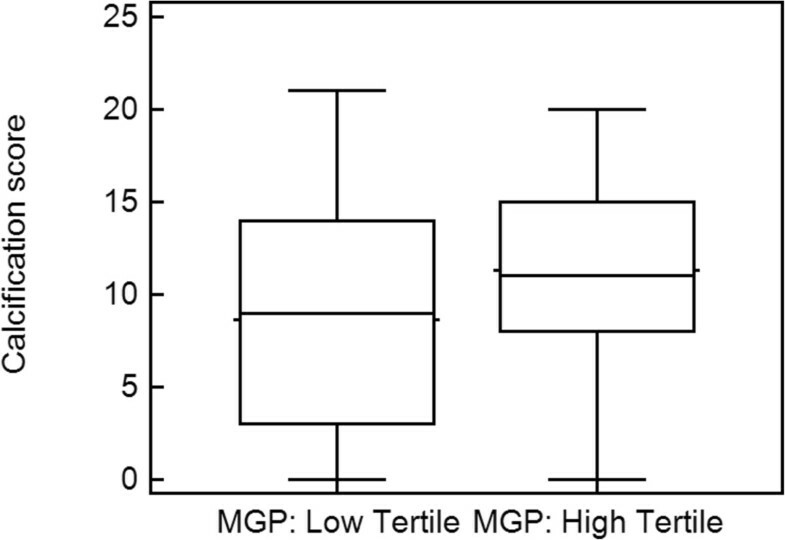 Considering the tertiles of dp-ucMGP levels (at 1647 and 2404 pmol/L), subjects in the highest tertile (tertile 3) had a significantly higher vascular calcification score than those in tertile 1 (but not compared with tertile 2): 9 ± 6 versus 11 ± 6 (p = 0.0414) (Figure 3). Compared to tertile 1, tertile 3 included more men with a higher BMI and with lower albumin levels. Our results confirmed that dp-ucMGP concentrations are higher in dialysis patients with a median concentration of 2148 [1542; 3251] pmol/L, whereas the normal range was found to be < 572 pmol/L in 62 healthy subjects. We also showed for the first time that dialysis patients treated by VKA have significantly higher dp-ucMGP concentrations than not treated dialysis patients. Lastly, we showed a mild but significant correlation between dp-ucMGP and vascular calcifications. We confirmed that the concentration of dp-ucMGP was higher in dialysis patients than in the healthy population we had also tested. Indeed, the median concentration in our HD population was: 2148 [1544; 3237] pmol/L, which is much higher than concentrations observed elsewhere in non-CKD and CKD non-HD populations [7, 23, 25, 26, 32]. The mean concentration of dp-ucMGP in our population (2704 ± 1798 pmol/L) is however very comparable to the concentration observed by Schlieper et al. in their 188 HD subjects (2850 ± 1768 pmol/L) . This high concentration of dp-ucMGP in HD patients is not fully understood. These patients are clearly sensitive to vitamin K deficiency, and this is likely because the recommended diet in HD patients is deficient in vitamin K [19–22, 24]. However, decreased excretion or catabolism of MGP associated with decreased glomerular filtration is also a plausible explanation for the molecular weight of MGP (11 kDa) [7, 33]. In addition, a classical exponential relationship has been observed between dp-ucMGP and estimated glomerular filtration rate . Lastly, the burden of vascular calcifications in HD patients could also influence the level of dp-ucMGP (see below) [25, 32]. For the first time in HD patients, we showed here that VKA treatment strongly and independently impacted, and actually increased the levels of dp-ucMGP, although the clinical and biological profiles of these patients were very comparable to HD patients not receiving this therapy. Vitamin K is necessary for the carboxylation of MGP and is thus a key vitamin in the process of MGP activation [9, 18]. An increase in the inactive form of the protein, dp-ucMGP is thus to be expected. Such an increase in dp-ucMGP levels in VKA treated patients has already been shown in the general and in CKD populations but not in HD populations [8, 23, 25]. In HD patients, some authors have demonstrated a decrease in dp-ucMGP levels associated with vitamin K therapy [7, 10, 27]. Our results confirm that patients being treated with VKA must be considered separately in studies involving MGP and underline the potential role of dp-ucMGP in monitoring the vitamin K status of HD patients . Because MGP is a potent inhibitor of vascular calcifications [1, 2, 4], some authors have suggested that the protein may be useful in the monitoring or even the detection of vascular calcifications in CKD or HD subjects [25, 35]. In the present study, we confirmed a significant correlation between dp-ucMGP levels and the calcification score in the univariate analysis and this association was confirmed in the multivariate model. Similarly, we found that the patients in the highest tertile of dp-ucMGP levels had a significantly higher calcification score than the patients in the lowest tertile. Our results confirm those published by Schurgers et al., who also showed a positive association (both in univariate and multivariate analysis) between dp-ucMGP levels and the calcification score in 107 CKD patients (including 40 HD patients) . Schlieper et al, however, did not confirm any relationship between dp-ucMGP levels and the calcification score in 188 HD patients . Interestingly, these two authors used an ELISA method to measure dp-ucMGP, which could explain, at least in part, some discrepancies between their studies [7, 8, 25]. For the first time, we used an automated assay with a high analytical performance. Another potential explanation of discrepant results could be the differences in techniques applied for calcification detection. Schurgers and colleagues used the most sensitive technique, i.e. multislice spiral computed tomography , Schlieper used a modified Adragao score , which is an extension of the Kauppila method  and we used the classical Kauppila method, as recommended by the KDIGO guidelines . In our prevalent HD population, the correlation between dp-ucMGP levels and the calcification score remained relatively poor. Also, the overlap between the MGP tertiles regarding the calcification score was high, making the measurement of dp-ucMGP levels uncertain, at the individual level, in detecting or estimating the burden of the calcification score. 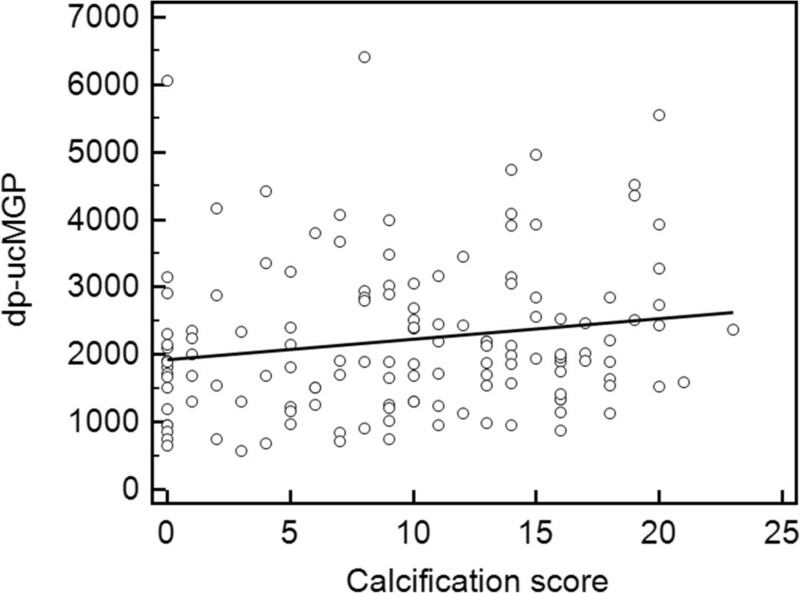 This positive correlation between dp-ucMGP levels and the calcification score supports however the theoretical role of MGP in the development of vascular calcifications. It also advocates the need for additional studies, particularly with other active isoforms of MGP [7, 22, 32, 35–39]. For instance, total uncarboxylated MGP (which may be partially bioactive) has been negatively associated with coronary calcification in dialysis patients . Moreover, reduced levels of non-phosphorylated carboxylated MGP (also partially bioactive form of MGP) has been associated with increased cardiovascular mortality and with vascular calcifications in dialysis patients . An human ELISA for the measurement of the fully bioactive form (phosphorylated, carboxylated MGP) is still not available on the market. The positive association described in the present study between dp-ucMGP and BMI or CRP has also been described by others [25, 26]. The negative association discovered here with plasma albumin and the positive one with FGF-23 levels, and with dialysis vintage, on the other hand, has not been found to date in HD patients, and this deserves further investigations. There are several limitations to our study. First, our population was a prevalent HD population and the study is observational. Further studies with incident cases and follow-up of hard endpoints would be welcome. Moreover, our HD population was relatively older (71 ± 17 years old), in comparison with other studies (67 ± 13 y in Schurgers’s study  and 59 ± 11 y in Schlieper ). Because age is a well-known determinant of vascular calcifications, different results might be observed in younger HD patients. Second, it would be interesting to confirm whether patients being treated with VKA have a higher risk of vascular calcifications. This was not the case in our population (data not shown) but our sample of prevalent VKA treated patients (n = 23) was probably too small. 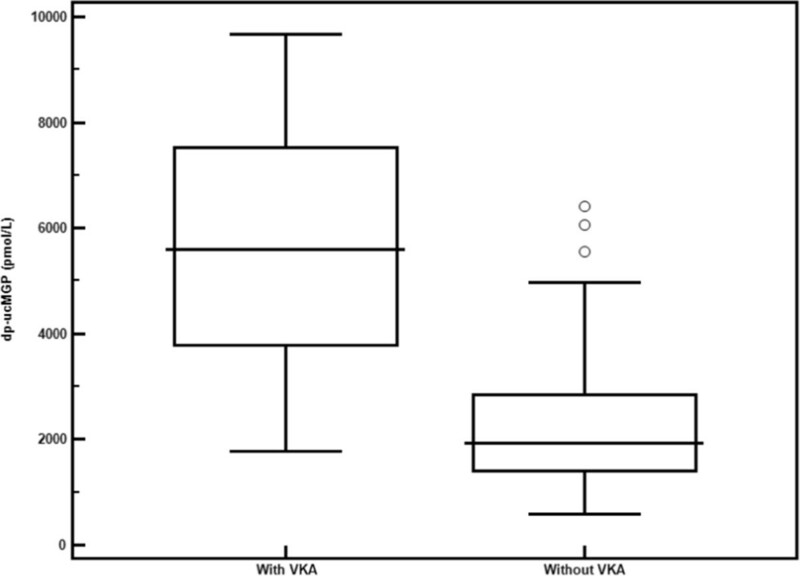 Several authors have suggested that VKA treatment is a risk factor for vascular calcifications or calciphylaxis in HD patients but this assertion deserves further study [24, 32, 35, 39–46]. Third, the Kauppila method is not the most sensitive way of detecting vascular calcifications and we did not directly measure neither vitamin K levels nor other vitamin K dependent protein like PIVKA-II (protein induced by vitamin K absence II). However, the Kauppila method is the approach recommended by the KDIGO . Lastly, we do not have precise data regarding the VKA adequacy (INR are not available) and the duration of VKA therapy in all patients. However, VKA is widely prescribed for atrial fibrillation or valve replacement and therefore, long term therapy must be considered in the majority of our treated patients. In this observational study, we confirmed high levels of dp-ucMGP in HD patients. For the first time, we used an automated and efficient assay to measure dp-ucMGP. We confirmed the potential usefulness of MGP (dp-ucMGP or another active isoform) in the assessment of vascular calcifications, although this finding has, to date, been the subject of debate in the literature. For the first time, we showed that dp-ucMGP levels were much higher in HD patients being treated with VKA. This observation underlines the specific role of the inactive form of MGP, dp-ucMGP (measured by the automated assay) in assessing vitamin K status. This measurement could be of great interest in monitoring the vitamin K therapy if future randomized studies, notably the VitaVasK trial , confirm the effectiveness of this vitamin in HD patients [18, 28, 32, 34, 35, 39, 44, 47, 48]. We would like to thank Pierre Lukas, Agnès Carlissi, Romy Gadisseur, Michèle Focan and Arnaud Borsu for their help with the samples (collection and measurement). We also thank Rosalie Bonmariage and Isabelle Mourad for their help in the writing of the manuscript. Pierre Delanaye is consultant for IDS. Etienne Cavalier is consultant for IDS and Diasorin. PD and EC are the principal investigators. PD and EC have been involved in drafting the manuscript. EC is the Biochemist who measured all chemical data. LM is the radiologist who assessed the calcification score. PD, JMK, XW, MM and NS are the clinicians who included the patients in the different centers. They all participated to the acquisition of the data. HP performed the statistics. JMK has critically corrected the manuscript as Chief of the Department of Nephrology (Liège). All authors read and approved the final manuscript.